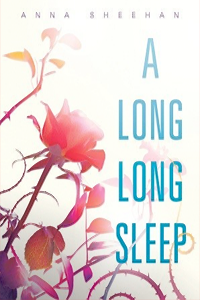 I coincidentally read two modern retellings of Sleeping Beauty in a row and A Long Long Sleep was by FAR the better one. In fact, I'd give it five stars if it weren't for the somewhat off-putting start to the novel. Sixteen year-old Rosalinda (which sounds like Briar Rose, get it?) gets kissed and wakes up from stasis after being in the chemically induced sleep for 62 years. The world around her has significantly changed during the time she was "asleep" and she missed all of the Dark Times that killed millions and millions of people, including the very few she ever knew; her parents and her best friend and boyfriend Xavier. Losing everyone you've ever loved is tough enough for a teenaged girl, but combined with the utterly foreign world she suddenly finds herself in, the pressure of one day taking on the all powerful UniCorp (the legacy from her parents) and a kind of robot on the lose that's possibly out there to kill her, it's no surprise that Rose is pretty messed up. These are enough reasons for her to act the way she does, yet her lack of character and the way she lets everyone walk all over her without any form of protest is really annoying in the first half of the book. She's a completely spineless and unrelatable main character and while the world of UniCorp is fascinating (particularly in the case of Otto) it's not enough to keep the story going by itself. However when the heartbreaking story from Rose's childhood finally unravels it is in fact astonishing and so very, very sad. It certainly explains why the girl turned out the way she did and I admit I had to fight back a few tears for her when reading all she had to endure. The conclusion to the novel is quite disturbing and there's a certain ick-factor involved. Yet, it's also quite beautiful to see the story come to full circle and I can't imagine it finishing any other way.